It's not hard to turn a pot of delicious pasta into an inedible mess. Forget about it while it's boiling on the stove or drain it and let it sit out for too long, and you run the risk of eating a mushy, sticky clump of spaghetti for dinner. Now scientists think they've found a way to prevent pasta from sticking together even if you don't follow the cooking instructions to a T.
As Foodnavigator reports, the secret is an enzyme developed by the German company Mühlenchemie. High-quality pasta made with high-protein flour is better at holding its shape when cooked or left out for a long time. But cheaper pasta tends to use softer, low-protein flour, which makes noodles more likely to turn gummy, fall apart, or stick together if you don't cook and eat them quickly enough. 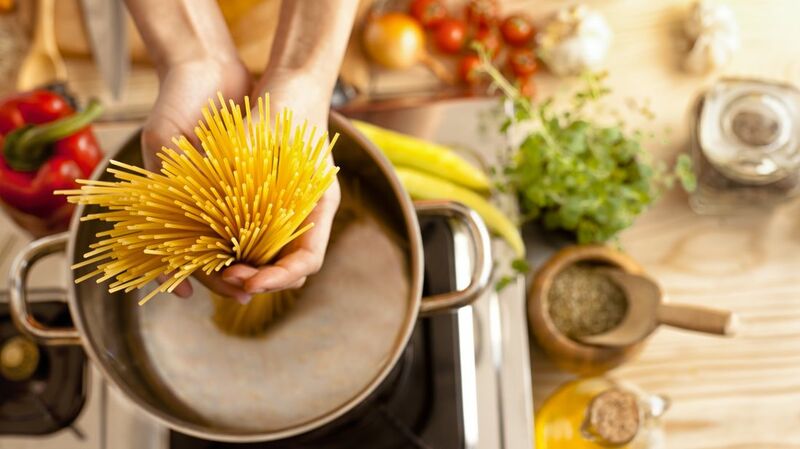 When the enzyme, dubbed Pastazym PD, is added to low-protein pasta flour, it stabilizes it, achieving the texture and high cooking tolerance of higher-quality products at a much cheaper price. This means that consumers would need to go out of their way to overcook pasta with the added enzyme, even if they're inept in the kitchen. Mühlenchemie debuted their enzyme system last year and it's still new to the food manufacturing world. When it does start appearing in products, it won't be listed on the label because it's technically a processing aid, not an ingredient. But you may notice your pasta turns out better. If you're looking for a way to improve your pasta as quickly as possible, check out these tips from real chefs.